In the past few days, many people have sent questions by email, Facebook Messenger, and in the comments on our blog. People keep asking what Picr will become and what exactly we are busy building. Someone even asked if we were 17hats, a site to help self-employed people manage their business. First, I would like to say that we are not struggling. Oh, and we’re not 17hats! If you came by our office, you’d see the tremendous energy and excitement we have for developing the next version of the product. We’ve simply pivoted our strategy—a typical move for any startup. Think of it this way: You set a goal to summit Mount Everest. You plan for a few months, train, get the right equipment, and arrive at base camp. You started climbing, and even get half way to the top. Then you encounter a dangerous crevasse and have to go down a few thousand feet. While you gave up some of elevation gain, you’ve greatly increased your odds of reaching the summit. That’s what’s happening at Picr. We’re revising our route to boost our success. In my previous post, I promised to explain more about Picr and what it will look like. This may actually take some time and a few posts, so bear with me. In this post, I’ll at least try to give an overall sense of where we’re headed. But rest assured, our original intent with Picr—to help photographers get more bookings—remains unchanged. Our vision for how we’ll get there does. The old vision, while a great one, was flawed. Here’s how we discovered those flaws, and how we plan to fix them. When we first determine the issues freelance photographers face, we thought we could solve them by creating a two-sided platform. Kind of like the Airbnb model. It would be a tool set for photographers on one side and a marketplace for clients on the other. It sounds simple, right? It was not. We tried many iterations and changes to adapt this two-sided platform model to the photography business. For example, we came up with different pricing “packages,” but few knew how to use it. Our “instant book” a photographer capability never took off either. We learned a lot, though. Things like clients want to get to know a photographer before booking one. Particularly with wedding or family photos, clients want to meet with them in person. These meetings are where the clients actually commit to booking. In short, we found that what works for a business like Airbnb does not work for the photography industry. We also realized that scaling our platform was a daunting task. We knew that most photographer bookings happen locally, so had developed a location-based model. We planned to roll it out to various cities once we’d solved the supply and demand puzzle of the two-sided platform during our launch to our first metropolitan area, our hometown of Portland, Oregon. Although we succeeded with solving the supply side with photographers, we never solved the demand side piece. Perhaps we didn’t spend enough time and effort to figure out the right product market fit. By spending more time and money we could have solved this piece of the puzzle and also found the right market fit, but we identified a bigger roadblock to success—adding each new city would require spending tremendous resources. Simply enough, our model was difficult to scale. I know that companies like Uber have launched city by city, but that’s only because they had no other option. They spent hundreds of millions of dollars, perhaps even billions, to get established in cities around the world. However, they had access to almost unlimited resources for capital. We do not and are not planning to raise any capital before we prove that our model works and can scale. We have the resources and we need to succeed with our new strategy and complete confidence that we will. During the last half of 2015, we communicated with hundreds of photographers in person and by phone. Add in email and chat, and we spoke with over a thousand photographers. Through those conversations, we collected huge amounts of information that helped us learn a lot about the experience of working as a professional photographer. One thing we learned really stood out: Most photographers struggle to get new customers due to a broken workflow. Workflow is not just software, but the whole business, starting from how you get leads or customers to how they serve them and how you bring them back for a second or third photography session. We felt like we could solve this problem. Around 200,000 photographers in the U.S. claim to the IRS that their income comes from photography services. Yet close to 500,000 photographers in this country earn at least $2000 to $3000 a year from photography work. Most of this second group is very creative and talented, but lack the business workflows to succeed. They get two to five clients from social media here and there, but don’t know how to get more. To their detriment, they don’t understand business and marketing. On the other hand, many less-talented photographers make a great living because they have excellent marketing and business skills. They can sell their services for higher prices, but deliver low-quality results. I believe this type of photographer damages the industry. They probably won’t be too excited about what Picr will soon offer because it will kill their competitive advantage. A third group of photographers—those who have both talent and business and marketing skills—probably won’t use Picr. They don’t need us because they’ve already worked hard to establish a workflow. And it works. Even if Picr offers a workflow that is much better and cheaper, convincing this group of our value will take lots of time and effort. We don’t plan to target this group. Our mission is to help that group of photographers who are talented and creative, but struggle to make a living at it. Most of them have a second job that helps them pay the bills or make just enough from it to survive and pay the bills. Here’s where I lay out where we’re headed with Picr. We’re developing an all-in-one solution to support the business and marketing needs of freelance photographers. In our vision, that solution will be much more than just beautiful software. It will include three major components: the software, education and community. As mentioned earlier, we aren’t 17hats—or SproutStudio or ShootQ. We see these as incomplete solutions with a poor user experience and user interface. On top of that, we view them as expensive relative to the value they provide. Imagine a solution that will handle all aspects of your business, from creating a beautiful website and hosting all your images to getting leads and communicating with your clients, managing all your projects, running transactions, marketing and re-marketing. Picr will cover it all, so you won’t need to use any other tools or services. Everything inside the Picr platform will be seamlessly connected, so it will be both easy and pleasant to use. Plenty of resources teach you about photography. They discuss how to take better pictures, use cameras and other equipment, and work in tools like Adobe Lightroom and Adobe Photoshop. Few resources teach you how to run your business and get more leads and clients. If you do find something, it’s rarely relevant to the photography business or is too generic to provide useful information. For example, you won’t find information that will help you double your revenue in six months. Picr will. So in addition to our beautiful software, we will educate you on starting your photography business from scratch, and assuming you have true talent as a photographer, how to reach levels of success that let you quit your other job in a few months. It will explain how to start making much more money in less time. You might be skeptical, but apply what you learn from Picr and you’ll see business grow. Strong community is the third, and equally critical component. Though Picr can’t succeed without a community, the main reason for its existence is to help you succeed. By the way, this isn’t just an online community—it will go far beyond that and into the physical, offline world. Imagine a world where you and other photographers can exchange your knowledge, time, resources, gadgets and more, and you all benefit from such exchange. Where it’s always win-win for every community member. What I’ve shared is a lot, but there’s much more. Expect more details in the coming weeks. Currently, we are working on building the Picr software, and we love what we see. Right after our alpha test, we will start working on an educational piece. Then sometime after that, we will start building the community, something that’s actually already started with this blog. You’ll also see that many of the things that other companies and people tend to charge money for, we will provide for free. I would like to thank all of you who follow us, read, comment and collaborate with us. You all are our early adopters of the community. This is going to be an exciting and awesome journey and we’re so glad you’re on it with us. People fear others stealing their ideas. I see this when “wantrepreneurs” ask me to sign a non-disclosure agreement (NDA) before sharing their ideas with me. I always refuse because I know it’s impossible to steal an idea. So I’m not worried if our competitors look at these posts and try to copy our idea and strategy. It would be impossible to truly realize our vision without us. 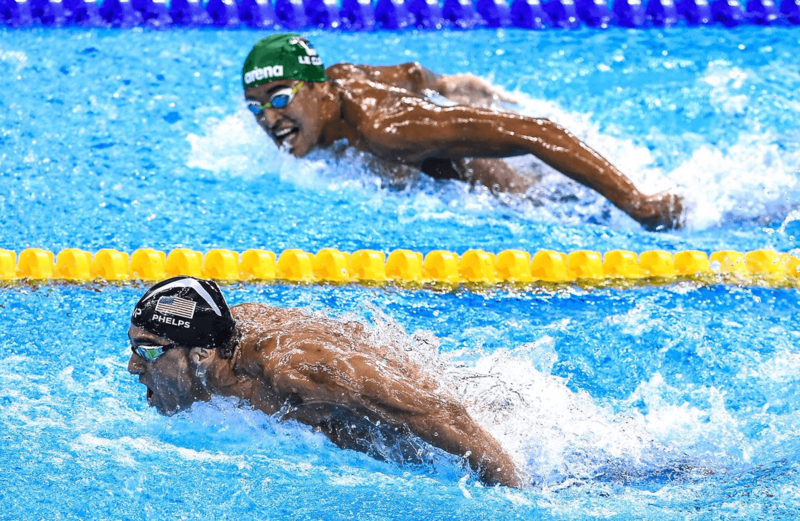 As this great quote with a picture from the Olympics says, “Winners always focus on winning, losers always focus on winners.” At Picr, we plan to focus on winning—for us and for you.